TAPPO IN POLIPROPILENE ADATTO ALLA PROTEZIONE DEL MATERIALE AVVOLTO INTORNO AL TUBO NELLE FASI DI MOVIMENTAZIONE E TRASPORTO. COLORE STANDARD NERO, POSSIBILITÀ DI COLORAZIONI A CAMPIONE. 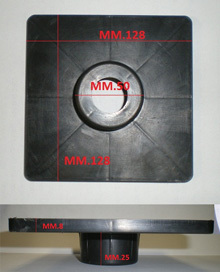 TAPPO PER BOBINE IN POLIPROPILENE NERO PRODOTTO CON TECNOLOGIA DI STAMPAGGIO AD INIEZIONE DI MATERIE PLASTICHE. IL TAPPO PER BOBINE VIENE UTILIZZATO NEL PACKAGING DI ROTOLI DI CARTA; FILM ESTENSIBILE; FILM AUTOADESIVI; FILM PROTETTIVI PER LAMINAZIONE; FILM TERMOADESIVI PER TESSUTI, CARTE FOTOGRAFICHE, TELI. IL TAPPO PER BOBINE STANDARD VIENE FORNITO IN POLIPROPILENE NERO. E' POSSIBILE MODIFICARE LA TIPOLOGIA DI MATERIALE ED IL COLORE.